Google AdWords keyword tool is the Google’s keyword research tool. The exact name of this tool is Google AdWords Keyword Planner. 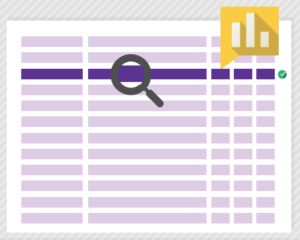 Both ads publishers & advertisers use this tool to find out preferable keywords. In this blog post, I’ll show you how to use the Google AdWords keyword tool. First of all, visit the tool. Here’s the link. You’ll now have to sign in with a Google account (your Gmail address). Hit this button . Then you’ll be taken to a new page. In this page, you can search for different keywords. You can use the first box to put your required words or phrases. I’ve written “Google AdWords” in the box. There are also some filtering options. Using these options’ tabs , you can filter keywords. I didn’t filter anything using the tabs though you can do as per your requirement. Finally, hit this button to get ideas. Then you can scroll down or up or go to next pages for checking different variations of your searched keyword. 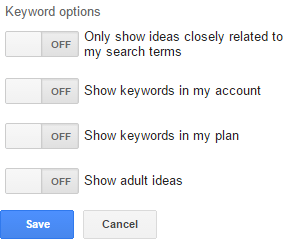 So using Google AdWords Keyword Planner, you can get different relevant ideas of your searched term. You can also come to know about a keyword’s competition level, average monthly search volume, suggested bids along with many other things. Google AdWords Keyword tool is totally free. So you can use it without any cost. Advertisers use it to find out profitable keywords & assess how much they may need to invest for a specific keyword. Publishers, on the other hand, can utilize it to find low competitive, long-tail keywords. To start with the tool, you’ll have to visit its site. This is the site link of the tool. After visiting the site, you’ll see the homepage of the tool. On the middle-left corner of the homepage, you’ll see this button on which you’ll have to click. If you’re logged in with your Google ID in your browser, then you’ll automatically be signed in. If not, then you’ll need to have a Google ID (a Gmail address). You know that creating a Google ID is a very simple process which just needs a Gmail account. It’ll open up the main page of the tool. On the page, there are 5 options in total which are for making your keyword research more relevant. Each of the options has also its sub-categories through which you can make your search more accurate. There are also some links for learning about the tool. You can learn different valuable things by visiting those links. 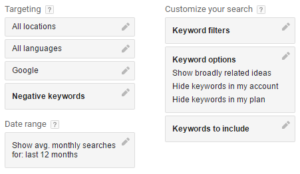 Now, come to the first option of the Google Keyword Tool “Search for new keywords using a phrase, website or category”. These are the boxes from which you can make your desired queries. The first box is for dropping the keyword that you wanna learn more about it. Suppose that you need to search for Pizza Recipes, then just leave the phrase in the box. If you don’t need to make your query more specific, then you can hit the “Get Ideas” button on the bottom of the widget. On the other hand, to do a more specific keyword research, you’ll need to go for the other sub-categories too. In the second box of the tool, you can put the landing page of your desired site. 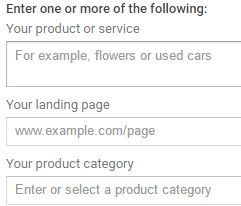 The third box is for selecting the product category. There are hundreds of product categories available in this section which you can see from the drop-down menu of the tool. So, select the most appropriate one from the list of product categories. Selecting the product category is effective in making the search results narrower because if you search your keyword according to a specific category, then keywords from irrelevant categories won’t be there to confuse you. By the way, the next options are more important than the second and the third boxes of this tool. These are the options that you must take care of. Now, I’ll show you how to use the options. You can see that the first option here is “Targeting”. So, what does it mean? Targeting simply specifies the things that will narrow down your keyword research result. Here’s the box which will allow you to select your required region. You have the room for selecting countries, cities, regions etc. After typing a few initial words will likely to show up suggestions. As I’ve tried with Uni, the box showed me the following suggestions. The list was, in fact, very long, but I just snapped a little portion. You can see that you have the full control of selecting a country or its cities or regions. This way, you can make your queries more specific and relevant to your need. 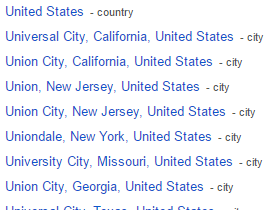 Selecting the USA means that you’ll come to see only those searches that are given inside the country of the USA. Similarly, you can select your preferred country or place as per your requirement. To select a specific place, you’ll need to put the name of the place in the box and hit the “Save” button. If you wanna get your keyword research result in your native or any other language, you can do that too by choosing that from the option “All languages”. 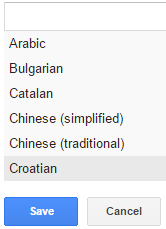 Type in the box or find your preferred language from the list of languages. After your selection, click the “Save” button for saving it. The next option is to decide which search engine to go with. You can have the options for Google or the combined search engine results. To do this, hit the “Google” button. If you wanna have your result only for Google, then there’s no need to change anything as the previously saved option is for Google. If you wanna exclude some keywords from your result, then “Negative keywords” will work for this. Hit the button and type the keywords that you don’t wanna see in the list of your keywords. The next button is for selecting the average search volume of your keywords. Typically, the search result will come up with the recent 12 months average searches per month. 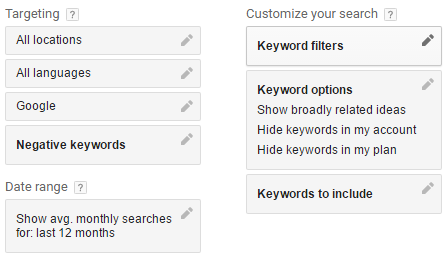 If you wanna view different period’s average monthly search volume, then the following option is for that. You can use the range to put the month and year as per your wish. So, decide a range and then hit the “Save” button. You can specify a lot of things from the options. The competition selection has three different variations. You can select the competition level of your keywords. Don’t think that this competition level means the actual competitiveness of your keywords. This competition is appropriate for giving ads, not for writing on keywords. So, avoid this option when you wanna get keywords for writing blog posts. This part of Google Keyword Tool is very helpful in keeping your preferred keywords in the result page. I often take the help of this option for having my required keywords. To do this, hit the “Keyword to include” button and then write down the keyword (s) that you don’t wanna miss in the keywords on the result page. And from the following two options, you can also choose so many things that will give you the ultimately narrowed result. So, these are the options that you can utilize to make your keyword research process more relevant. Now, I’ll show you a keyword research which will surely help you get how the Google Keyword Tool really works. So, I’ve made the first keyword research with a keyword “Grammarly review”. Let’s see what the tool shows up! I just wrote the keyword in the first box and then didn’t use any other option. After hitting the “Get Ideas” button, it showed me a list of related keywords. You should keep in the “Keyword ideas” section because this will show the keywords individually. Here you can see that average monthly search volume of the keyword. There is also the information of the competition and the suggested bid of the keyword. The average monthly search volume shows the range of searches per month during the last 12 months. Earlier, the tool showed the exact number, now it shows only the ranges. You can’t take any decision by seeing the competition of the keyword on this tool unless you’re going for giving AdWords ads as I’ve already discussed that before in this post. 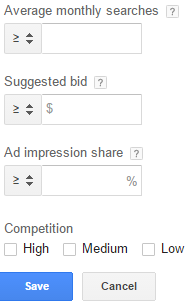 The suggested bid is for advertising, so if you’re using the tool for researching keywords on which you’ll write your blog posts, then you may not analyze this. But if you’re an AdSense publisher, then this amount will help you find out profitable keywords. How is that? Well, you know that AdSense pays on a per click basis. So, if you get clicks on a low CPC keyword, then your AdSense earning will be that much even though you get so many clicks. On the other hand, if you can get clicks on high CPC keywords, then your AdSense earning will be high even though you get fewer number of clicks on the AdSense ads displayed on your blog. An AdSense publisher earns around 50% of total CPC, so you should choose profitable keywords by seeing the suggested bid amount if you’re an AdSense publisher. This search is a broad search where I’ve not narrowed down anything. If I had specified some other things, the tool would have come up with specific keywords. I’ll show this too later. Now, come to the point on how to choose keywords using Google Keyword Tool. You know that finding out suitable keywords is the main purpose of using a keyword research tool. First of all, you’ll have to know which keywords to choose. There are some criteria that every online business owner takes when it comes to choosing keywords. To me, I choose both long-tail and short-tail keywords that are searched a decent number of times on a monthly basis. The main of mine is to rank my keywords on top of SERPs and for this reason, I need to check how many times a keyword is being searched per month. Though you shouldn’t believe the number of search volume that’s displayed on Google Keyword Tool, you can still get ideas whether a keyword is searched a decent number of times or not from it. To do this, you need to check the large number beside the keyword. As for example, you can see that “Grammarly review” has shown a large number like 10K – 100K. This clarifies that the keyword is a popular one and I can further reveal the how many times the keywords are exactly searched by using another tool, SEMrush. I actually do this. First, I use Google AdWords Keyword Tool and then I bring SEMrush. The combined efforts of the tools make me find out suitable keywords for my blogs. But you can see that “Grammarly review” isn’t a long-tail keyword, so what you can do now. Then you should scroll down in the list of keywords on the tool. When you’ll meet a keyword that is at least 4-word long and also searched by a decent number of times, then you can pick the keyword. After that, check the keyword with SEMrush and see whether it’s a low KD one or not. KD means Keyword Difficulty and if a keyword is a low KD one, then you can expect to rank it easily. You’ll see that not all the keywords are your desirable ones. This time, you should do the search using other specific options. To do this, go back to the keyword research panel of the tool and then check again. Now, I’ve dropped “Grammarly review” in the box of “Keyword to include”. Opting in for this will bring up the keywords that will have the portion “Grammarly review”. Earlier, the result came with more than 700 keywords and now it has only 19 keywords. This means that the research has come up with a narrow result. You can now pick a suitable keyword more easily than before. Here, I’ve seen one keyword “Grammarly plagiarism checker review” which is a long-tail one and the search range is between 100 and 1K. This is a nice keyword that you should then check further with SEMrush to find out its KD. If you see that the KD is low, then you can start writing a blog post on the keyword. This will surely give you a promising result. Also, some people research keywords using only Keyword Planner. Now, I’ll show you how to it so that you can use the tool to research keyword without using any other tool. GKP is still one of the best and favorite keyword research tools. It is a great post for beginners. Thank you very much for paying a visit to my blog. You know that GKP is Google’s product, so it must have great quality. Keep visiting & letting me know your valuable thoughts.